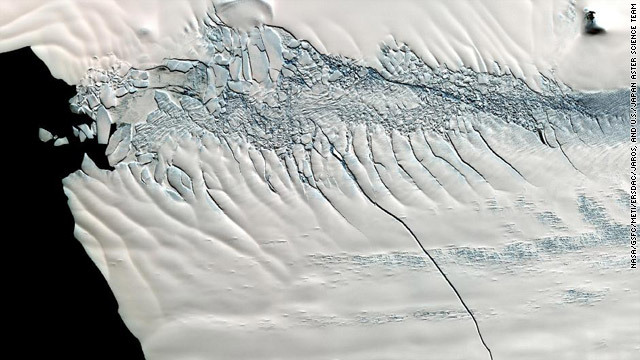 "In mid-October 2011, NASA scientists working in Antarctica discovered a massive crack across the Pine Island Glacier, a major ice stream that drains the West Antarctic Ice Sheet. Extending for 19 miles (30 kilometers), the crack was 260 feet (80 meters) wide and 195 feet (60 meters) deep. Eventually, the crack will extend all the way across the glacier, and calve a giant iceberg that will cover about 350 square miles (900 square kilometers). This image from the Advanced Spaceborne Thermal Emission and Reflection Radiometer (ASTER) instrument on NAS's Terra spacecraft was acquired Nov. 13, 2011, and covers an area of 27 by 32 miles (44 by 52 kilometers), and is located near 74.9 degrees south latitude, 101.1 degrees west longitude." Go to Join a company in the menu and cseelt the WET: World Expedition Trucking company. If you can't figure it out, let me know and I'll send you a message in the game.Update. I see you already joined a company called Imperial Freight. Go to View my company and click Leave company . Then you can join our company. The great work and i read the articles its good. http://www.whatisthelunareclipse.com/. the website have great graphic images and lots of knowledge about earth and space science. Wonder what is under all that ice. Wonder if the treaties will hold up.